New York City’s highest rated Marriott hotel looks forward to welcoming attendees of the 40th annual 9th Avenue International Food Festival. New York City's highest rated Marriott hotel. The Residence Inn by Marriott New York Manhattan Midtown East hotel excitedly awaits the arrival of the Ninth Avenue International Food Festival, taking place May 17-18, 2014 from 42nd – 57th Street. The annual event combines international cuisine, art and entertainment in one location, adjacent to Times Square. An estimated 200,000 individuals are expected to attend New York’s oldest and largest continuous Food Festival over the course of two days. The Residence Inn by Marriott New York Manhattan Midtown East hotel offers the perfect home away from home, with new all-suite accommodations that feature fully equipped kitchens, luxurious bedding and spacious living areas. Reservations can be made by calling (212) 980-1003 or by visiting the hotel’s website. Book your reservation today to experience all this renowned New York hotel has to offer, located in the heart of one of America’s most iconic cities. 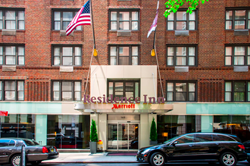 The Residence Inn by Marriott New York Manhattan Midtown East hotel is close to many New York City attractions like Times Square, Grand Central Station, the United Nations and much more. We offer a range of hotel amenities for both business and leisure travelers, including free high-speed Internet access, business meeting spaces with catering services available, free hot breakfast buffet, accessible rooms with 32” wide openings, full kitchen suites available and a fitness center.